Welcome to the website of the National Hannie Schaft Foundation. Although this page is in Dutch, we are very happy to help you find your way in getting more information on Hannie Schaft and the sisters Truus and Freddie Oversteegen. Please contact us at: info@hannieschaft.nl or visit our facebook page or twitter. For an insight in international press attention as to Freddie Oversteegen please check here. The book is written by Truus Menger – Oversteegen, who together with her sister Freddie Dekker -Oversteegen and the famous Girl with the Red Hair, Hannie Schaft were a formidable female trio of armed Resistance fighters. Their fellow companion in arms Hannie Schaft became the icon for female Resistance in the Netherlands. This book describes their wartime Resistance experiences, without the heroic flavor. The ugly wartime seen through the eyes of young adults, teenagers that is, who rose beyond the occasion. Because they had to stand up against the terror and evil of the occupying forces. Thank you very much for the overwhelming interest in the English version of the book of Truus Menger-Oversteegen “Not then, not now, not ever”. Unfortunately the English version is out of print. We are working very hard on the reprint. If you are interested to purchase one, please contact us at info@hannieschaft.nl and we will make sure you will receive a copy as soon as they are back in stock. On 25 November 2018 the annual Hannie Schaft Commemoration took place. In front of well over 400 people former Cabinet member and Groningen Mayor Professor Jacques Wallage held the “Hannie Schaft lecture”. In an impressive and personal plea he called upon everybody present to combat injustice and to draw a line stating “until here and not further”. In addition, he encouraged more compassion and adherence in our present day society. In his opening statement our chairman addressed the recent passing away of Freddie Oversteegen, the last of the female armed resistance trio. “No man is an island”, a selection of the mini opera “Hannie & Gemma” – which will premiere in 2020, 100 years after Hannie Schaft was born – was performed. Last but not least Hesce Mourts played the cello and Zara le Clercq the piano. Several children read impressive poems. Wander Kenter, the grandson of Truus Menger-Oversteegen, spoke a few words on the need to resist, if only in the smallest form. This was the first commemoration without the Oversteegen sisters. Nevertheless, their families were present as usual. After the service at the Church, a silent march was held towards “Kenaupark”. 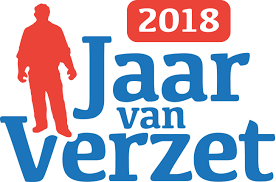 After a minute of silence to pay respect, the Dutch flag was hoisted and several wreaths were laid at the monument “Vrouw in Verzet” (Woman in Resistance). 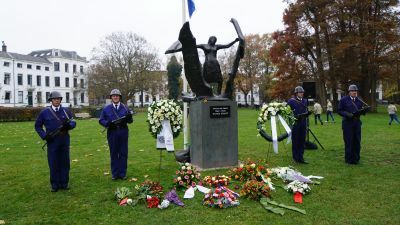 Among the people who laid wreaths were the mayors of both Haarlem and Bloemendaal, the National Hannie Schaft Foundation, representatives of the German city of Osnabrück, the British Violette Szabo Foundation, representatives of the Foundation for women’s concentration camp Ravensbrück and the “Gemma” sorority (of which Hannie was a member). The commemoration was attended by people of all ages. Honorary Board member Paul Elsinga, former resistance fighters and a Dutch Canadian who had witnessed the reburial of Hannie Schaft in 1945 were among the people who were present. In short, we can look back at an impressive and successfull commemoration service. Truely inspired, our Foundation will continue its mission. For more pictures of the Commemoration see here. Picture credits: Ab van der Deure.